Not all factions began on Earth. Xeno Explorations Incorporated, the youngest group vying for control of Maxwell, had its genesis on the surface of the new planet itself. This is a booster pack for the Alien Frontiers: Factions game expansion. This is not a stand alone game. 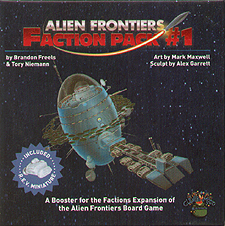 The Alien Frontiers board game and the Faction expansion are required for play.